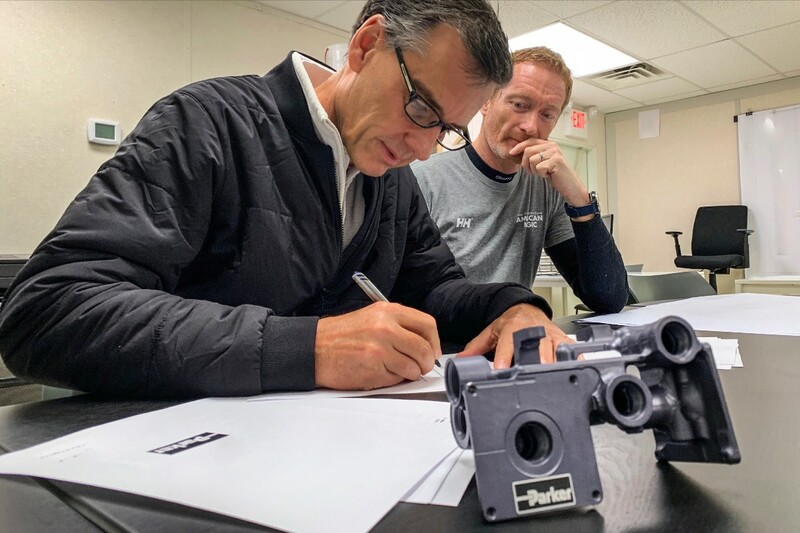 Craig Maxwell (left), vice president and chief technology and innovation officer for Parker Hannifin and Dimitri Despierres of American Magic’s design team. American Magic, a challenger for the 36 America’s Cup, has teamed with Parker Hannifin as its official control systems partner. The two entities will work together to develop and implement systems for American Magic’s racing sailboats with a focus on lifting surfaces and the wing. Parker will integrate controls, hydraulics and actuators into a motion and control systems that helps the boat achieve stability as it lifts onto its foils and accelerates. Parker holds more than 8,000 patents.